Project Textbook is up and running for winter quarter. Fall 2015 was very successful and we anticipate expanded participation as awareness grows. 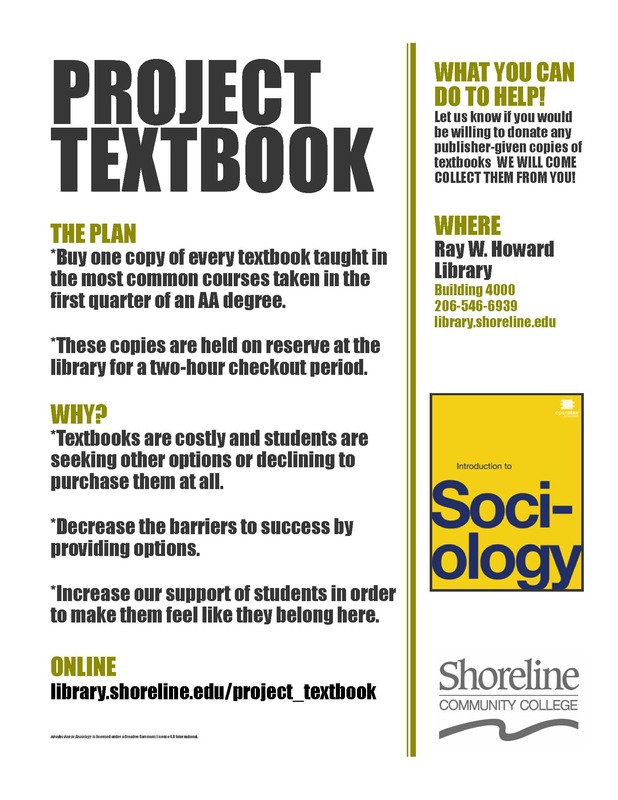 We are working with Shoreline’s instructors as well as U-Bookstore to make available course materials for Winter 2016. These continue to act as a supplement, like a broad course reserves collection, that does not remove the responsibility for students to acquire their own materials in accordance with curricular requirements. We want to help them bridge the various obstacles that make it difficult to have access, especially in the quarter’s early weeks. To that end, please help us spread the word to students as well as new faculty. That information is hugely beneficial when it comes from someone standing in front of a classroom, actual and virtual. Shoreline Community College Library remains committed to providing our students with choices to access their required course materials. Project Textbook is a notable manifestation of our commitment. Thanks for all your support during Fall 2015. As we all begin to make preparations for Winter 2016, the library’s staff is delighted for the chance to work with you – again – in meeting needs and promoting success. Put us to work!